What defines a family? From a child’s perspective, your family is the people who love you, take care of you, see that you have all you need, comfort you when you are sick or sad, laugh with you, teach you, hug you and kiss you. The staff at St. Mary’s meet every one of those criteria. Our residents have a huge family, with more aunts and uncles and brothers and sisters than most kids will ever have. And that family crosses every single artificial barrier that society imposes. 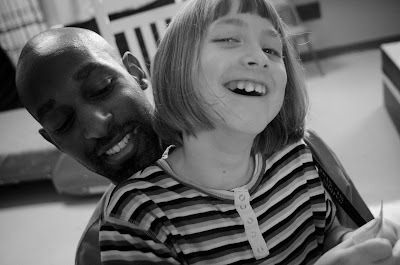 Things like race, religion, gender and national origin mean nothing when the heart of an adult who works here and the heart of a child who lives here make that magical connection. I see busy nursing assistants take extra time to lovingly fix a little girl’s hair so that she looks extra-special that day. I see busy nurses pause to comfort a boy who is having trouble breathing. I see countless members of other departments, such as maintenance, housekeeping, food service, education and administration (just to name a very few) go out of their way to hug or talk to a child and make them feel special. I see so many examples of family love here, every day, that I am constantly awed. So when one of our children grows up, when it is time for him or her to move on, we say goodbye with heavy hearts. That face we have come to love, and to count on seeing every day, will no longer be here. It takes a while for it to sink in, but when it does, the pang of separation is there. They were, are and forever will be part of our family. When contemporary jazz musician Marcus Johnson was in Norfolk recently for a concert, he had problems with his keyboard. So he bought one to use just for the show while his regular keyboard was being fixed. During the performance, Johnson asked if anyone in the audience had a charity. Cpl. Rickey Smith, a Norfolk sheriff’s deputy who was sitting in the second row, spoke up at his wife’s urging. He told Johnson that he works in security for St. Mary’s Home for Disabled Children, which cares for children with severe disabilities from all around Virginia. 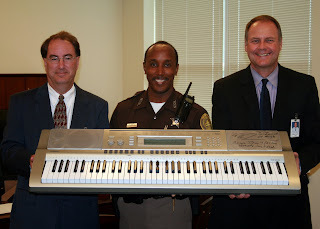 Smith donated the keyboard to the Home on behalf of the Norfolk Sheriff’s Office. That’s Smith in the photo wearing his uniform, with St. Mary’s CFO Wayne Jones, left, and CEO William C. Giermak, right. Giermak said the generous gift will be perfect for entertaining residents. This week, Sister Mary June Morin of St. Mary’s Home for Disabled Children makes an appearance on the city of Norfolk’s “Norfolk Perspectives” program on cable TV-48, Norfolk’s Neighborhood Network. 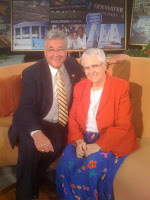 Host Bob Batcher interviewed her about what it has been like to spend a lifetime caring for children. Sister is celebrating her 50th year of working at SMHDC. 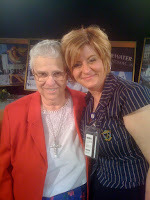 You can watch the “City Slice” segment with Sister Mary June here. That’s Bob Batcher with Sister in the photo at far left; the other photo is of Sister and the program’s producer, Michelle Gabriele Harrell, on the set last week. This is Sister’s second recent appearance on local television. Just last month, she was featured on the community affairs program “What Matters” on Hampton Roads’ public TV station WHRO. She was the guest of honor, yet Gladys Jones kept getting up from her seat, asking others if they needed anything. “Forty-three years of serving children, and at her own luncheon, she’s still serving others,” said William C. Giermak, CEO of St. Mary’s Home for Disabled Children. Gladys joined St. Mary’s Home as a certified nursing assistant on June 2, 1966, soon after graduating from high school. Today, exactly 43 years later, staff — and many of her family members — gathered to honor Gladys as she retires. Gladys came to St. Mary’s Home because she loved children and always wanted to be around them. She saw SMHDC’s population evolve from children with mild disabilities to the children and young adults with severe disabilities who live here today. “I’m going to miss every one of you all, especially the children,” Gladys said during her luncheon. And everyone at St. Mary’s Home for Disabled Children is going to miss Gladys.